This post by Andrew Tilker originally appeared on the Saolablog. Tilker is an associate conservation scientist with Global Wildlife Conservation. The jungles of the central Annamites are renowned for their incredible diversity of small carnivores. The number of sharp-toothed furry critters roaming these forests should send a shiver of fear down the back of anything rabbit-sized or smaller – and a shiver of excitement for any tropical biologists who find themselves in this corner of southeast Asia! It’s an impressive list: yellow-throated marten, Asian palm civet, masked palm civet, large Indian civet, small and large-toothed ferret badgers, spotted linsang, small Asian mongoose, crab-eating mongoose ... it’s like a small carnivore celebrity gathering. But as spectacular as these animals are, none can compare, in my opinion, to the star of the show: the Owston’s civet. The Owston's civet (Chrotogale owstoni) is among Asia's most mysterious carnivores. This member of the small carnivore gang is unique for several reasons. For a start, it has a very small distribution: found in Vietnam, Laos and a small corner of China, for all practical purposes, it can be considered an Annamite endemic. It’s also one of the most striking mammals to stalk these jungles. Slender and muscled, it has a buff-coloured background coat streaked by midnight-black bands that spill down the body and then dissolve into Pollock-like spots and streaks. And the civet is as mysterious as it is visually stunning. Very little is known of its ecology, distribution or status in the wild, with most assessments consisting of little more than best guesses from biologists working in the region. The species is currently listed as Vulnerable by the IUCN, which, at one step away from Endangered, means that it’s not doing great. In a region where wildlife trade flourishes, the days of this small forest phantom could be numbered. Fortunately, there are still areas in the Annamites that seem to support decent numbers, though these havens are increasingly rare. I picture them as remnant species-pools fast evaporating in a scorching desert landscape. 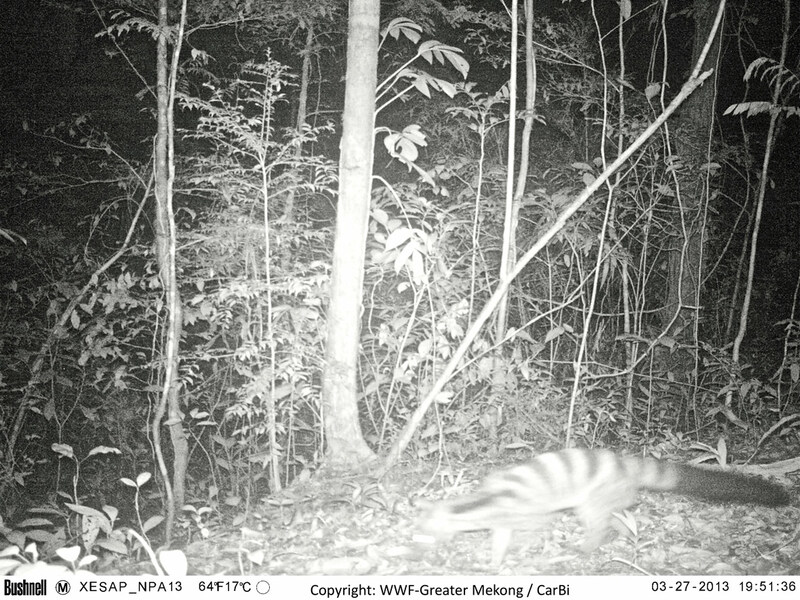 These camera trap photos suggest the remote forests of Laos might be the last stronghold of the Owston's civet. The gist of the research is this: Camera-trapping work from western Xe Sap captured a surprisingly high number of Owston’s civet photos. In fact, during the year-long study, it was the most commonly photographed small carnivore, surpassing even run-of-the-mill species like Asian palm civet and crab-eating mongoose. These encounters confirm what biologists have observed in other parts of the civet's range: this is a terrestrial species that, unlike many other small carnivores, spends most of its time on the ground. Sadly, this trait probably makes it more vulnerable to snaring by hunters. 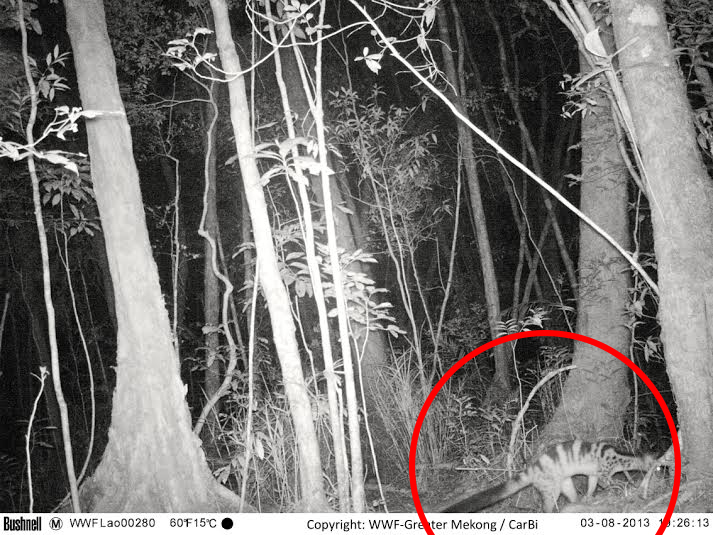 But the most important insight, in my opinion, is that camera traps can easily pick up the ground-roaming Owston’s civets if these small carnivores are present in an area. If they don't show up, it's likely because their numbers are so low that they're close to being wiped out – or they simply aren't there. And that has profound and worrying implications for the fate of the civets in other parts of their range. In fact, despite more than 15,000 camera-trapping nights in Vietnam's Hue and Quang Nam Saola Nature Reserves, the World Wildlife Fund (WWF) failed to track down the Owston’s civet, even though these areas were once home to the species. In other words, it seems plausible that the carnivores are gone – another victim of the relentless snaring that has decimated wildlife populations in Vietnam. And that also means the remote forests of Laos might now be the last and best hope for the survival of this remarkable species in the central Annamites. Let’s hope we can hold on to it. This critically endangered Sunda pangolin was rescued and released by the crew of Vietnam's Carnivore and Pangolin Conservation Program.